dck worldwide has given its “Building a Better Community” award to My Brother’s Workshop (MBW). This award is designed to recognize a civic group or charitable organization that has played a significant role in changing lives in the U.S. Virgin Islands. 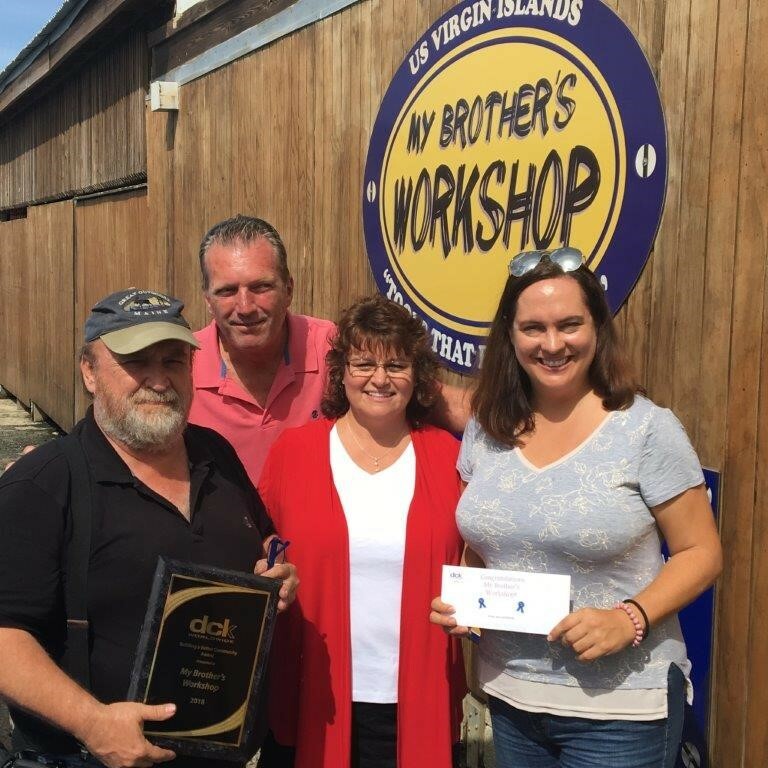 A $5,000 donation from dck worldwide and a plaque recognizing My Brother’s Workshop for their community involvement in the U.S.V.I. was presented to the charity’s Jenny Hawkes, executive director, and Scott Bradley, program director Scott Bradley. The company launched its Building a Better Community Award program by soliciting nominations throughout St. Thomas, St. John and St. Croix. The company received submissions from multiple organizations. “It was a difficult decision for our selection committee, as there quite a number of worthy charities that are making significant contributions to communities throughout the islands,” Stephen D’Angelo, CEO and president. According to D’Angelo, the company’s employees in its office locations and construction project sites get involved in supporting the communities where they work and play. As the general contractor for several construction projects throughout the territory, dck worldwide looked to recognize an organization that shared in its vison of improving neighborhoods and peoples’ lives in the region. My Brother’s Workshop is a non-profit V.I. charitable corporation. It has been organized to provide hope, faith and purpose to at-risk and high-risk young people. Founded in 2007, it provides on-the-job training and placement and teaches construction, culinary arts and customer service skills. In addition to serving the region’s disconnected youth and helping them improve their lives, after last year’s hurricanes My Brother’s Workshop provided over 37,000 meals and construction-related relief work to the islands’ population. dck worldwide is a global construction company dedicated to developing, managing and building projects around the world. For more than 95 years, corporations, developers and governments have trusted dck worldwide to flawlessly bring their blueprints to life. It is headquartered in Pittsburgh, Penn., with regional offices in California, Hawaii, Arizona, Florida, the Philippines and throughout the Caribbean.